We are family owned and operated celebrating our 49th anniversary this year. Visitors enjoy a guided tour of a working fish farm. This informative educational tour is enjoyed by all ages. It is a hands-on experience where different species of fish are highlighted from fingerlings to adults. The tour includes a modern production system called raceways, where visitors learn firsthand how fish are farmed and even get to hand feed the small fingerling trout. GROUP RATE not available on weekends or Holidays. However we will gladly reserve picnic tables and space for your group on these days. Weekdays a minimum of 20 people fishing is required to qualify for the group rate. Group size is limited to no more than 100 people fishing per visit. If you have any questions or would like to schedule a group outing, please contact Jim or Jeanie at (734) 426-4772 or click the button below to fill out a reservation form online. Our farm is open from May 4 until the end of September and is available 5 days a week with advance reservations. 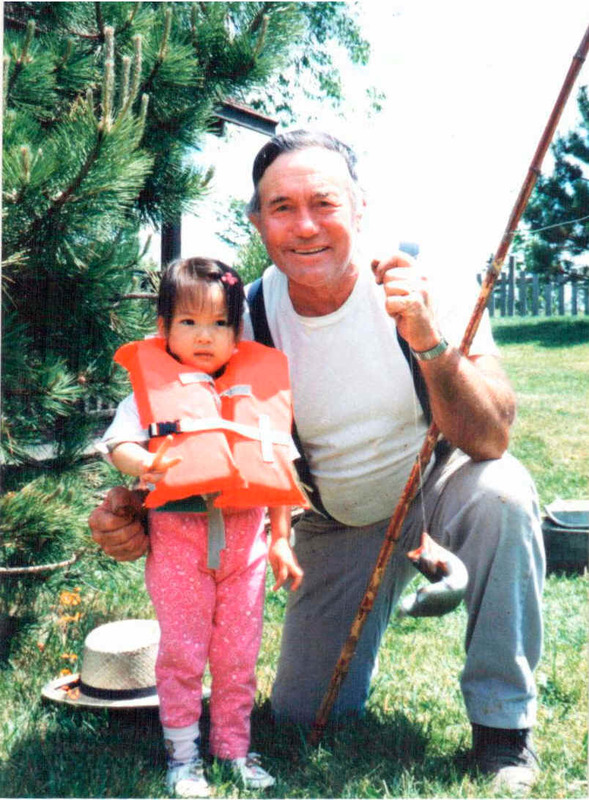 Our founder Bob with a child that just caught her very first Trout! EVERYONE in the group catches a Trout that will average between 10 and 14 inches. All fishing equipment and bait needed is provided & expert assistance in guaranteeing everyone a catch! The fish is cleaned & ready for the grill. You may also choose to have your fish iced & packaged individually so you can enjoy it at home. You may bring in your own food & beverage for the group. This is a family-oriented farm. NO alcohol is allowed in the park - but lots of fun is. A Trout that averages between 10 and 14 inches. If your group members catch additional fish to take home, our regular price of $7.39/lb for trout will apply, but cleaning is free. Use of the fishing lodge with handicap restrooms. Reserved picnic pavilion that seats up to 100 people. People in your group who do not want to fish pay just the entrance fee of $5. Non-fishers 4 and under are admitted free! School Groups can bring non-fishing chaperones (including bus drivers) in for free. If they'd like to fish, they'll receive the same discount as the group. A deposit of $2 per fisherman is required at the time of your reservation. We're a pretty popular place and dates fill up quickly, so please try to make your reservations at least 4 weeks in advance so you aren't disappointed. Fore safety and service considerations, groups of 20 or more need to make reservations. All children under 54" MUST wear a lifejacket at all times while at the farm (we supply at no charge).